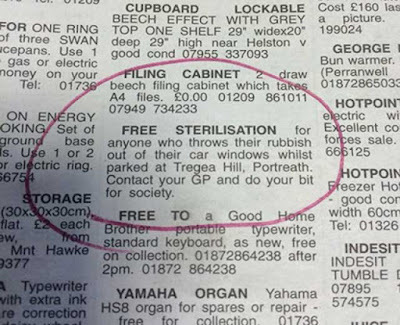 A resident fed up of seeing their Cornish village strewn with litter has suggested free sterilisation to the culprits. 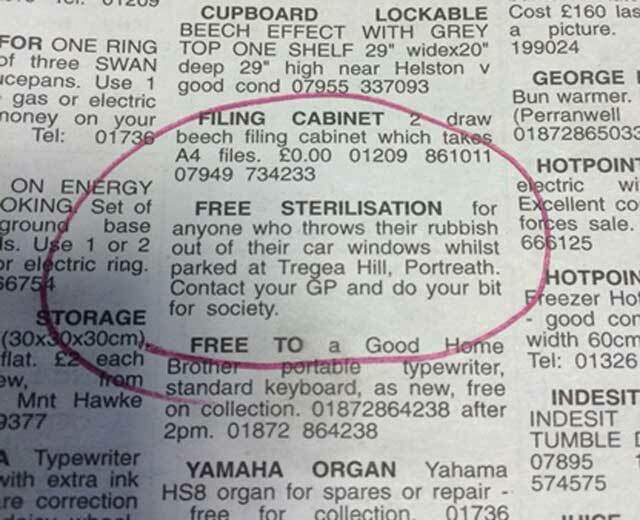 An ad placed anonymously in last week's West Briton classifieds read: "FREE STERILISATION for anyone who throws their rubbish out of their car windows whilst parked at Tregea Hill, Portreath. Contact your GP and do your bit for society". Littering in Portreath, Cornwall, has been a long-term problem, especially during summer months when tourists descend on the picturesque seaside village in their droves. Chris Watts, chairman of Portreath Parish Council, is annoyed by the problem. "It's an ongoing issue in some parts of the village," he said. "Portreath is hit by large amounts of litter every time the sun comes out, as regular as clockwork. "We (the parish council) employ a litter picker once a week, but unfortunately we can't afford him every day and he is fighting a losing battle." Mr Watts added that in his experience locals tended to pick up after themselves. "Some visitors don't seem to bother looking for bins which is extremely annoying because there are plenty in Portreath and they are all emptied regularly. It is a constant, ongoing problem."